This past weekend we had an adventure at The National Pet Show 2018 at the NEC Birmingham… it was fantastic! The National Pet Show celebrates pets, and aims to bring together animal lovers, and owners to show off their pets, and provide educational resources into the various animals we can share our homes with. The event was spread out over one large hall of the NEC, and was split up into different villages, featuring: small furries, animals (comprising the reptiles, minibeasts, fish, farm animals, and birds), cats, dogs, and a marketplace. The largest section by far was the Dog Village, which was not exactly unexpected as dogs are the most popular pets. It is also very easy for visitors to be able to interact with the dogs, as they all loved being pet, and seemed to really enjoy the attention! There were over 50 breeds of dogs on show, and it was really fascinating to be able to see some of the more unusual breeds. For me, the Alaskan Malamutes, Siberian Huskies, Czechoslovakian Wolfdogs, and Maremma Sheepdogs were all highlights. I am very much a crazy cat lady… the more you follow this blog, the more you will come to realise how true that is!! I mean the dress kind of gives it away!! So, I was really excited about the prospect of seeing lots of different types of cats… but was rather disappointed. It’s not that the cats were not there, it was just really difficult to see them. All the cats on show were being held in various carriers in rows just out of sight from the average visitors, and only the cats currently being judged could be seen… but only if you happened to be on of the lucky 5 or so people stood at the front of the tiny viewing display. I totally understand that cats are less willing to be pet than dogs, and could become easily stressed by thousands of visitors prodding them all day, and I reckon if I was part of the cat show I would have a had a great time seeing all the breeds… but as a regular visitor I felt like it was a slightly wasted opportunity. What I did see, I loved! The happy, fluffy Ragdoll from the Ragdoll Rescue who let me pet her was delightful, and the beautifully crafted cat trees from Sophisticated Scratch were both highlights of the Cat Village. The first animals to great visitors in the Animal Village were the farm animals: alpacas, Shetland ponies, donkeys, and miniature horses. I enjoyed petting the animals in this section, and learning about the therapeutic effects that these animals can provide. 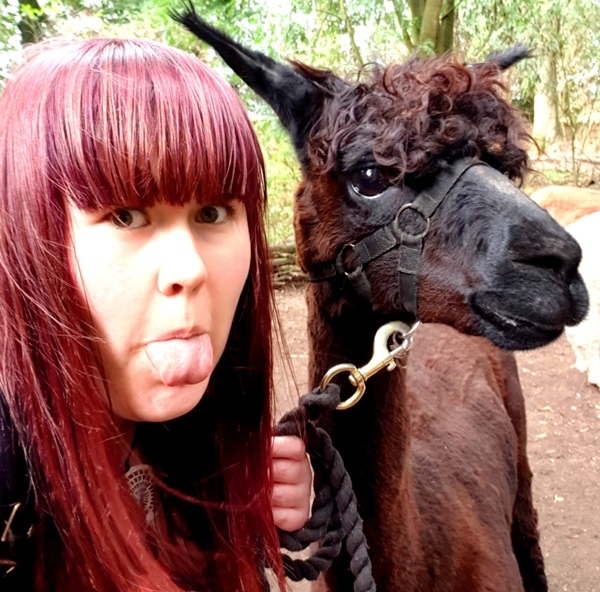 I am rather in love with alpacas, so for me, the The Alpaca Pals were a cuddly highlight! I would really love a little herd of alpacas one day… just need a slightly larger house first!!! I was excited to see the wide array of scaly creatures in the Animal Village. Snakes, lizards, and the likes are often overlooked in favour of the bigger fluffier animals, so it was really nice to see lots of these intriguing little guys on display. I was especially enamoured by the Crested, and Leopard Geckos, the Veiled Chameleons, and the Bearded Dragons… all of which are very much on my list of future pets! The reptiles were sponsored by Exo-Terra, and their terrariums and enclosures were brilliant to see, as they provided fantastic homes for the scaly guys. They were beautiful for human eyes, and provided lots of exciting enrichment options for their occupants; they have certainly given me a great deal of inspiration for my future pet goals! I really want budgies after visiting The Budgerigar Society‘s stand in the Animal Village! We got to hold an adorable blue budgie, who filled me with a love for these sweet little birds. Stay tuned for another post coming soon all about budgies as I will be doing my research into what these little guys are like as pets, and will share all my findings with you. Another feathered highlight was being able to cuddle up with lovely rescue hens from Fresh Start for Hens. This organisation saves ex-commercial hens from slaughter after their laying days are over, and provide them with loving homes for the rest of the natural lives. I had not realised how chilled out chickens were! and how much they love a good cuddle. Therapy chickens should totally be a thing… it was so relaxing sitting there stroking the hens… I could have sat there all day! If you are interested in re-homing rescue hens, join the Fresh Start for Hens Facebook group for more information. Last, but by no means least was the Small Furries Village, featuring: rabbits, chinchillas, hamsters, rats, and guinea pigs. Owning both hamsters, and rats, we were especially interested in these sections. I got to hold a lovely rat doe called Merida from The North of England Rat Society, and we bought a couple of rainbow fleecy hammock shelves from Rattie Angels (stay tuned for the review post). The Midland Hamster Club stand had lots of sleepy little hamsters on display, and I was pleased to see more of the unusual varieties. They had lots of great hamster care information on the walls, but I did feel a little sorry for the hamsters having to put up with all the noise and distractions during their sleeping time!! Thanks to CHINformative I am now completely in love with Chinchillas. The dispositions of these fluffy guys is not dissimilar to rats, and their fur is divinely soft. Perhaps another creature to add to my future pet list?! Phew! well done for getting all the way to the end! that was A LOT of information! On the whole I had a fantastic time at The National Pet Show, and more importantly increased my pet knowledge!